Figure 1. 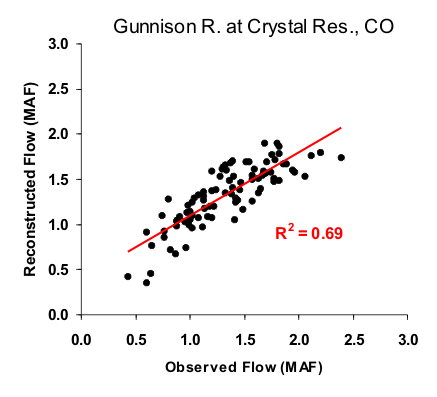 Scatter plot of observed and reconstructed Gunnison River annual flow, 1906-1995. Figure 2. Observed (black) and reconstructed (blue) annual Gunnison River flow, 1906-1995. The observed mean is illustrated by the dashed line. Figure 3. Reconstructed annual flow for the Gunnison River flow (1569-1997) is shown in blue. Observed flow is shown in gray and the long-term reconstructed mean is shown by the dashed line. Figure 4. The 10-year running mean (plotted on final year) of reconstructed Gunnison River flow, 1569-1997. Reconstructed values are shown in blue and observed values are shown in gray. The long-term reconstructed mean is shown by the dashed line.